Download the latest edition of the AJCS. Physical copies are available for purchase. Individual purchases are available for $5 per issue. Subscriptions are also available. For more information call the CCS office at 864.328.1809. We are currently refocusing the Journal and setting it up to be juried journal. We expect this process to be complete very soon. For now, check out our previous issues. 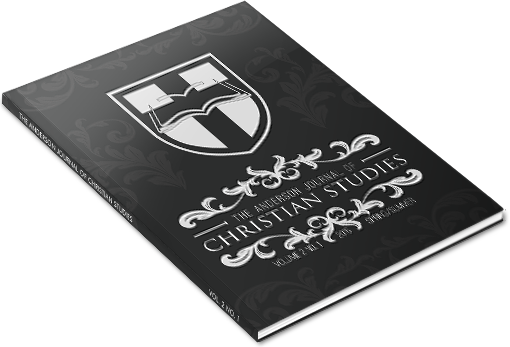 I hope you enjoy reading this volume of The Anderson Journal of Christian Studies. At Anderson University, we take seriously Scripture’s admonition that we are to love God with our minds. (Mark 12:30) We hope that this edition of our journal helps you to follow that admonition as you read its content. Chuck Fuller, Assistant Professor of Christian Studies at Anderson University, presents an excellent examination of Bishop Joseph Butler’s contentions regarding the continuation of personal identity after death found in his “Dissertation I—Of Personal Identity.” Fuller points out both the strengths and weaknesses of Butler’s arguments and commends their contribution to a Christian understanding of the persistence of personal identity after death. Greg Cochran, Director of Applied Theology and Associate Professor at California Baptist University, explores God’s covenantal concern for the poor and persecuted around the world. He contends that while God possesses concern for everyone who experiences poverty and persecution, He is especially concerned for His covenant people. In response to God’s concern, Christians should share particular concern for their brothers and sisters suffering from poverty and persecution. Spencer Haygood, Adjunct Professor at Anderson University, examines Paul’s Areopagus address in Acts 17:16-34. He explores whether Paul abandoned his focus on the gospel to present a merely philosophical speech in Athens. Haygood argues that, in Athens, Paul does not deviate from his evangelistic engagement seen throughout his activity in Acts. He also provides practical application for contemporary readers from Paul’s evangelistic methodology in Athens. Finally, in honor of the tercentennial of the birth of George Whitefield, I present an article on the theological and historical context surrounding Whitefield’s ministry in the American colonies in the eighteenth century. This article is the first of a three-part series on Whitefield. We pray this issue will glorify God and edify His church!